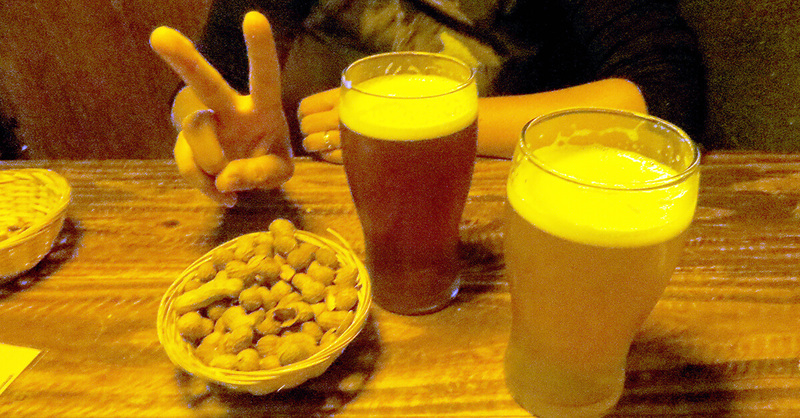 Argentinian microbrews: Downtown Bariloche • Where Is Your Toothbrush? Portland vs Seattle: Which city has the best food and beer? The reputation of Bariloche microbreweries preceded them to Buenos Aires, both by quality and number. Bariloche turned out to be a craft beer heaven, reminiscent of my adopted hometown of Portland, Oregon. And there are, in fact, so many cervecerias artesanales in and around town I did not manage to visit them all in our two weeks there. 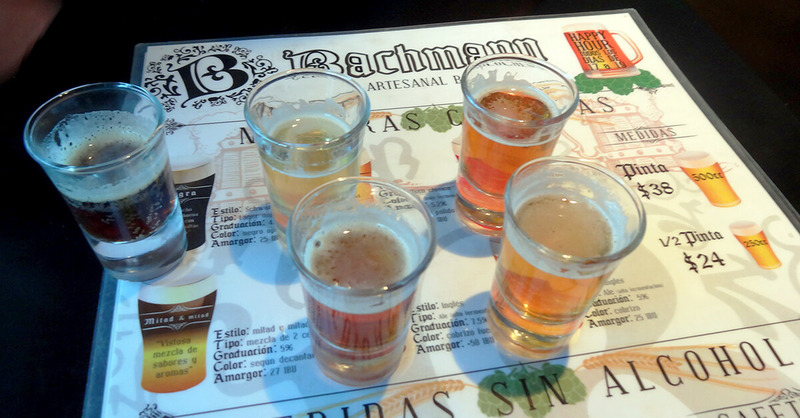 Here are six that I did visit, some more than once; in this post I present three Argentinian microbrews in downtown Bariloche, in the next, three outside of town. 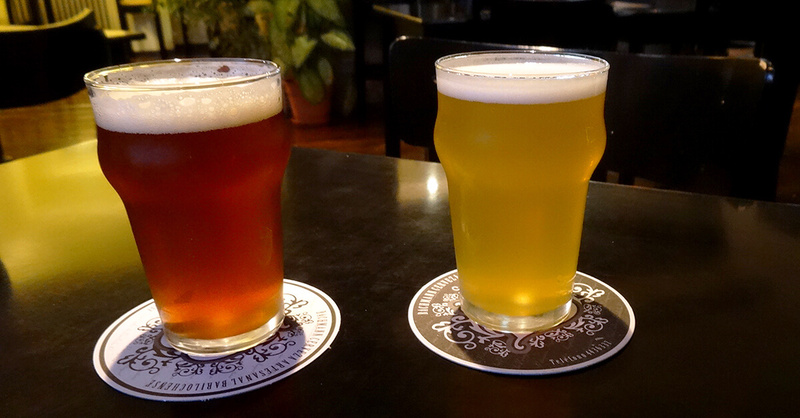 A peculiar feature of the craft beer scene in Bariloche is the designation of beers by color, while the same name can mean different styles in different breweries. Thus Rubia (blonde or light in color) is usually a lager but can also be a Kölsch, a pale ale or a wheat ale; roja (red) can be a Scottish/Scotch ale (which in some places are called Ambar, or amber), a pale ale, an IPA, or , and a negra (black) can be any of the German dark beers, a porter, or a stout. If in doubt, ask for clarification. Microbreweries (brewpubs, to be more accurate) in downtown Bariloche are concentrated in the streets radiating from the triangular square around Club Andino. The Rubia was a Kölsch (4.2% ABV, 20 IBU). Cloudy, straw yellow in color, with a refreshing start and a malty finish accompanied by persistent carbonation it was one of the better examples of the style I’d had. The Roja was an easy IPA (4.2% ABV, 40 IBU) that packed a friendly punch before opening up into its full flavor. All’s well that starts and ends well like this IPA, though there was something missing in the middle, like a churro without a dulce de leche filling. As dark as the Patagonian night, with a nice head and light chocolate hints, the Negra was a big enough porter (4.2% ABV, 22 IBU) to be encroaching on the stout territory. The IPA and Kolsch at Konna. Free peanuts! The pub/bar itself matched the brews. It’s small and got a little cramped with mountain folk by the time happy hour ended but it retained a cozy feel that invited lingering. Rock climbing videos played on a big screen, a house stray dog meandered through the legs, and Argentinian rock and reggae elevated the atmosphere. And if the excellent pizzas weren’t enough, there came a bonus: service was much better than the Argentinian average. Location: Juramento 73, behind the offices of Parque Nacional de Nahuel Huapi, next to the local jockey club. Prices: AR$28 (USD3.80 / DolarBlue2.70) for a half-pint, AR$35 (USD4.40 / DolarBlue3.40) for a pint. Two pints for the price of one during happy hour. Hours: Opens at 6:00 p.m. every day. Happy hour is from 7:00 p.m. to 9:00 p.m.
Cerveceria Bachmann has two locations: one downtown and another halfway to the long-distance bus terminal. The newer downtown restaurant features a modern, if a bit cold, mountain-style interior. 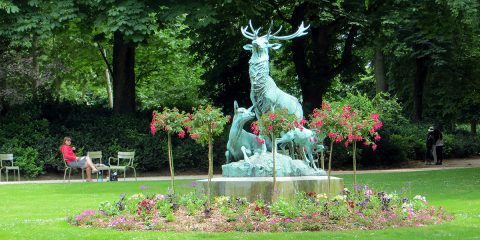 Morphine and some Argentinian rock bounced off the polished wood and stone surfaces. A 3-foot custom-made chocolate Easter egg with the brewery’s logo adorned the bar. The Rubia aims to be a classic Pilsner (5.2% ABV, 30 IBU). Stronger than most other Argentinian craft lagers, it came with a nice bite and a spring in its step but was a little too cloudy for my taste. It paired well with nachos. 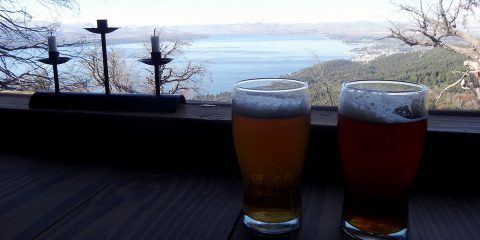 The Ambar was a typical Scottish ale (4.8% ABV, 20 IBU), easy on the palate, with malts balancing a very subtle hoppiness. The Pale Ale (5% ABV, 25 IBU) started with pleasant floral notes, reminiscent of golden ales, hopped and skipped through the middle, and ended up dry. Eminently enjoyable, it fell short of the pale at Manush (see below) and it got a little flat at the end of the pint. As its measurements indicate, the IPA (7.5% ABV, 50+ IBU) was strong and hoppy from start to finish, to the expense of complexity and nose. The hoppiness lasted through the dry aftertaste, inviting to sample a more refreshing brew right away. The Negra, a German Schwarzbier (4.8% ABV, 25 IBU) answered the call. Dark and very malty, it hit all the right elements of dark brews without the heaviness of porters of stouts. In cold fall weather it tasted like a light dessert. IPA and Pilsner at Bachmann. The beers at Bachmann were, overall, clean and very drinkable. In the sampler, all brews had a strange ‘undertaste’, almost like a signature bite, which disappeared in half and full pints, suggesting samplers aren’t the ideal way to get an idea of a brewery’s products. Locations: Elflein 90 (downtown) and O’Connor 1348. Prices: AR$24 (USD3.00 / DolarBlue2.30) for a half-pint, AR$38 (USD4.75 / DolarBlue3.70) for a pint. The menu does not include a sampler but I asked (“sampler” or “degustación”) and received 5 shot glasses of available beers for free. Pints are half off during happy hour. Hours: The downtown location opens for lunch at 11 a.m. every day (the O’Connor location opens at 6:00 p.m). Happy hour is from 5:00 p.m. to 7:00 p.m. 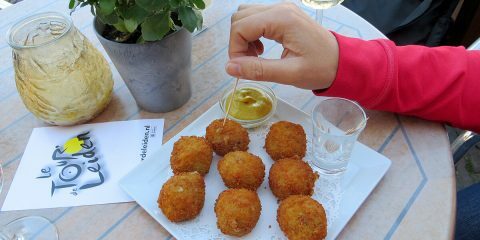 I visited Cervecería y Gastropub Manush three times during the two weeks in Bariloche—it was that good. Plus the Universal Traveler’s Lodge Hostel, where we stayed, had a tap with their Pale Ale (5.4% ABV), which we sampled it within minutes of arrival—the best welcome a microbrew lover like myself could ask for after a 23-hour bus ride from Buenos Aires. Not to mention, it was handsomely balanced, hopped and carbonated just right, and simply amazing. 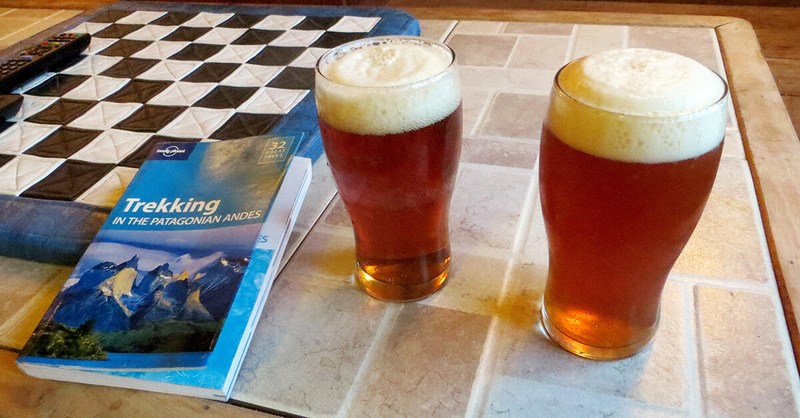 Welcome to Bariloche, with Manush Pale Ale at Universal Traveler’s Lodge Hostel. The brewpub itself is more of a cozy restaurant with stylish, Pinterest-worthy décor and excellent branding. On the first visit I tried the Victoria Red Lager (5.2% ABV), a strong lager with a reddish to amber color that was surprisingly refreshing and featured good, persistent carbonation and a malty aftertaste. The IPA (7.3% ABV) announced its presence with a strong hoppy perfume that flooded my nose with each sip. 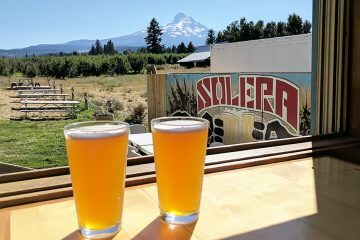 The correspondingly citrusy start rose to a hoppy finish, rendering a spectacular, strong IPA that reminded me of Oregon’s brews; it tasted like home. On another visit I had the Pilsner, perhaps the weakest of Manush’s lineup. Like many pilsners outside of Plzeň (Pilsen in German), it was a mere wannabe, confirming the reason the style carries a designation of origin: it’s something in the water. If all Kölsch brews were as tasty as the one at Manush (5.0% ABV), the style would surge in my ranking of favorites. It surprised me with hints of butterscotch, and while it would improve any already-perfect summer day, it was mighty fine in colder time, too. On the “dark visit”, the Extra Stout (5.5% ABV) complemented my ojo de bife (ribeye steak) to perfection with a creamy, tall head and thoughts of Häagen-Dazs coffee ice cream, each sip melting into the next one and a mildly sweet, though not malty, aftertaste. The tangy bite of lactose central to the Milk Stout (4.3% ABV) lightened its rich, malty, and creamy body. It was one of those rare beers I wanted to drink just to figure it out. I regretted not having the opportunity to try other beers Manush listed as available at other times: Honey Beer, Wheat Ale, Belgian Strong Ale, Belgian Dark Ale, Irish Cream Ale (4.5% ABV), Brown Porter, Imperial Stout, Draught Stout, and Milk Stout Chocolate. Overall, the fabulous Manush brews strike a rare balance: their complexity pleases beer nerds and their deliciousness draws everyone else. 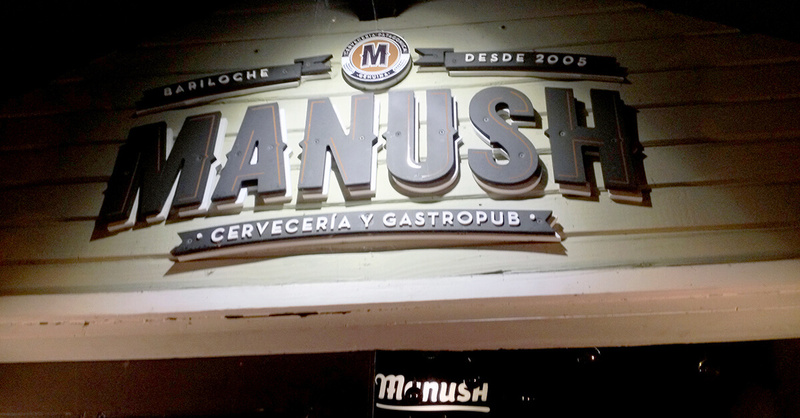 Manush is Where Is Your Toothbrush?‘s best craft brewery in downtown Bariloche! Prices: AR$24–28 (USD3.00–3.50 / DolarBlue2.35–2.70) for a half-pint, AR$32–38 (USD4.00–4.75 / DolarBlue3.10–3.70)for a pint. Discounted prices (to about 60% of normal) at happy hour. 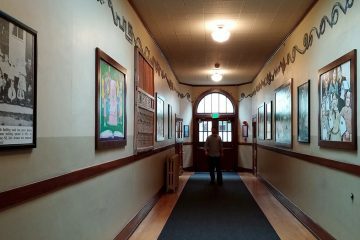 Hours: Open every day from 6:00 p.m. Happy hour is from opening until 8:00 p.m. There are three other microbreweries within a few meters of the ones above. I had already visited Antares in Buenos Aires and felt no need to go back. We couldn’t find Jaska on the dark street where it was supposed to be located and Ruta 40 was closed every time we walked by. I also spotted at least two restaurants (Familia Weiss and Refugio Blackrock) featuring their own microbrews, but I was too short on time to investigate. Lindsay and I made beer tasting into an activity, and all beer descriptions incorporate Lindsay’s observations. Any errors or omissions are mine. 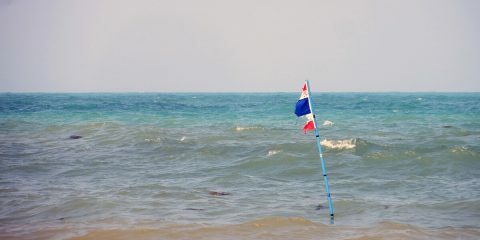 Dolar Blue is the unofficial exchange rate for the U.S. dollar, approx. 20% better than the official rate, up to 40% better than the ATM rate, and available only from street vendors. Learn more here. 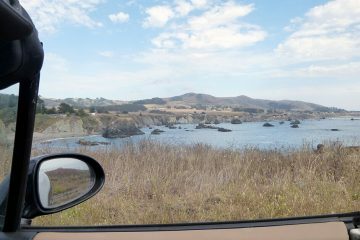 The Dolar Blue rate I use in this blog post series is as of April 28, 2014 (AR$10.30 per USD1.00), per DolarBlue.net. The official rate listed is also as of April 28, 2014, per Google (AR$8.00 per USD1.00). All dollar figures are rounded to the nearest 5 cents. Peter is a co-founder of Where Is Your Toothbrush? and The Salad Lobby as well as Immigrant in Chief at Salad Bowl USA. A non-fiction writer, he is the author of Guerrilla Yardwork: The First-Time Home Owner's Handbook. Other than travel and writing, his passions include ice hockey, brewing beer, and juggling projects. 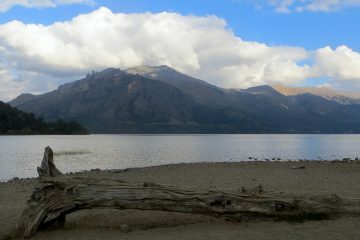 This makes us super excited – we will be heading over to Bariloche in a few days and I am dying to go to these places! Which had the best food? Excellent! Stay tuned for Part 2 (hopefully this Monday), covering microbreweries outside of town proper. Travel the world and eat your salad, too: Welcome to the new Where Is Your Toothbrush?